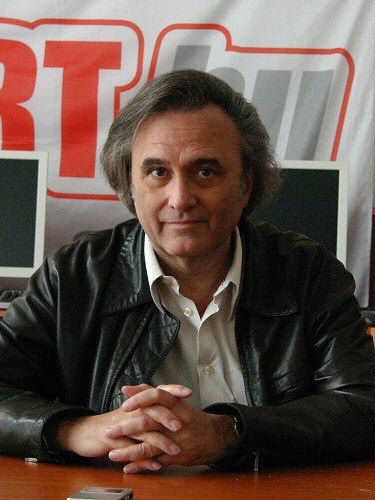 What can you say about Joe Dante that has not been said already? Director of The Howling, Gremlins, as well as Amazon Women on the Moon, Joe has been making great films for the last 40 years. When Joe speaks about filmmaking we sit as his feet and listen. I think that’s the only thing you can do — the glass is half empty isn’t going to get you anywhere. I think you’re right. I think that’s exactly what it is. It’s a leap of faith. –if you have a 90 minute movie that you can chop up into different episodes and run them at times that people, you know, will devote the ten minutes it takes to watch it, and then, “Oh, I like that, I’ll watch the next one,” it’s probably safer, I think, than getting them down — plunking them down and thinking that they’re going to watch the entire 90 minutes. Well, that’s actually what we did with our last movie, which was a narrative, a bunch of vignettes. And we just ended up — you know, it was at a festival. Nothing happened, so we just chopped it up and we — we’re putting it up on YouTube. At least people will watch it. Yes, people will. But the problem with YouTube is that even YouTube doesn’t know how much stuff it has. I know. It’s as — that’s why they’re able to actually take regular movies — I have movies that I’ve made that are on YouTube in segments that have been put up by people. And the studios involved don’t know. –unless somebody calls them and tells them. I never call them and tell them. Well, how do you feel about the issue with piracy? –opened in Italy. And already, the Italian dubbed version of the picture was up on YouTube. And I — you know, there’s — you can get them to take it down, maybe. But it depends on what country it is. I mean, because the laws are different in every country. Well, it is a promotional tool. And if you use it cleverly — and almost all movies have websites now — if you use it cleverly, it can — you can do it to your advantage. But you can’t stop a guy with a camcorder from going into a theatre in Singapore and shooting your movie off a screen and putting it on the internet. It’s almost impossible. Yes. So, in low-budget filmmaking what is the one thing that you would never skimp on? And one is the one thing you would never pay for? The one thing you never skimp on in low-budget filmmaking, I think, is the script. I mean, if you don’t have a script worth shooting, it doesn’t matter how well you do it or how badly you do it. It’s just not going to be any good. And what was the other half of the question? Oh, and what was the one thing you’d never pay for? It depends on a filmmaker. I mean, some people stint on the music. You certainly can’t stint on the camera. The image is everything. So, I don’t — I think it’s — that’s a variable. It depends on the project. I love film. It’s going the way of the dodo eventually. And the — because video — I saw — the other day, I just saw Winter’s Bone. And nice movie, a little depressing. But I spotted right away that it was shot on video. Because — and the tell-tale thing is usually if you — if there are trees or, you know, bare limbs in a shot, they always have a slight after-image. –Public Enemies has some really bad video in it with — the lights are blowing out and it just looks like a phony home movie. But it’s a great tool and certainly is going to make filmmaking more affordable for people. And the cameras now are so small that they look like still cameras. So, you can actually shoot completely surreptitiously on the street without anybody knowing that you’re making a movie. It’s — I think it’s a boon. I — it’s just what’s happening. I mean, do I love film? Yes, I love film. I love 65 millimeter film. I love Imax film. I like — you know, film is great. But — and it’s always going to have its uses. But the fact — I think, it — the fact that they don’t make film cameras anymore, still cameras, should be a tip-off that, you know, film is not going to be around forever. That is a great analogy. I really like that. Well, use it wherever you like. We’re going to definitely reproduce that. And then the five readers that we get will love it. So, what are your some of your favorite low-budget filmmakers? Well, I mean, almost all my favorite filmmakers are low-budget filmmakers. And remember that the filmmakers that we all talk about, you know, that everybody loves, like, you know, Jim Cameron made Avatar. Well, before he made Avatar, he made Piranha Two. And everybody started on a very cheap low level, on an entry level. And a lot of their films, a lot of people who made those films, you know, became great filmmakers. But you go back to their original works, and you can still see the gleanings of what was going to turn out to be great movies. I mean, Francis Coppola made the Godfather, but before that he worked for Roger Corman and made Dementia 13. And Dementia 13 is a pretty good movie. You know, the story isn’t very good. But it’s very cleverly and very artistic. And I really enjoy watching the early works of people who, you know, went on to do a lot of stuff. Because, you know, when you’re starting out, you’re not given much to work with and you have to try to make the best of it and use ingenuity. And the things that you learn, you apply to other movies that you make as you go along. And, you know, the only thing that’s important when you make a movie is what happens between when you say “action” and when you say “cut.” And all the rest of it around that is completely meaningless for the audience. The only thing that matters is what’s on the film. And it doesn’t matter whether you’re making an expensive movie or a cheap movie. It’s the same aesthetic. And you do learn, you know, a lot of tricks when you’re making low-budget films that you can use later in situations that are, you know, high-budget situations but have the same problem. Now, all right, it’s a good learning environment, I guess a sandbox. Yes. Yes. I recommend it. I think that — and I also recommend that filmmakers cut their own movies. Because they’ll never know what mistakes they make until they have to confront them in the editing room. And woe be to the guy who has a great editor and the editor gets him out of a lot of trouble and then he goes back and makes another movie without that editor and makes the same mistakes and the new editor can’t fix them. You know, we do it all. We’re a two-person outfit. And we actually — it’s a strange but sort of organic cycle. We love to edit. And then by the time we’re done editing — I mean, and we learn something about our shooting when we edit. And when we’re done editing, when we’re sick of it, we’re ready to start writing again. And when we’re sick of writing, we’re ready — it’s funny how it works, at least right now for us. Well, I was a terrific film fan when I was a kid. I practically lived at the movies. And so I’ve had — I guess, I didn’t realize it, but I was storing up a whole lot of film knowledge in my head. And I — I wanted to be a cartoonist. went to art school and discovered that cartooning was not an art and that if I wanted to stay in school, I’d better take something else. So, I took film. And, you know, it’s almost related to cartoons in that there are storyboards and frames and shots and things. And I sort of drifted into it, because I didn’t really expect to be a filmmaker. But I had an opportunity to come out to California and work for Roger Corman, making trailers. And that led to a chance to direct my first movie, which is an entree that I’m afraid is denied to most people today. It’s funny that you say that. Well, another person we’ve been speaking with, a friend of ours, Nina Paley, is — was a cartoonist and then she became a filmmaker. And now she wants to go back to cartooning. Yes. No, I can understand that. There might be a little more future in cartooning than there is in filmmaking. Why do you think there’s going to be more of a future in cartooning? Well, I just — I think the — that movies are changing. I mean, movies as we understood them are a 20th Century art form. And the 20th Century is over. It is now turning into something else. As far as where the movies are distributed and who they’re made for and who they’re made by — that’s all undergoing a tremendous change, partly because of the new technologies available to make films, but also the technologies available to show them. And, you know, whereas when I was starting out, my advice to a kid would be “Get yourself an eight millimeter camera and, you know, make some eight millimeter films,” now you can make with a videocamera some pretty good-looking movies. And you can finish them to a point where we were never able to do with film because you can do it on the computer. Coppola once said that he thought the future belonged to those who were going to make their own movies. I think that’s true to a degree, because you can actually make — if you can afford to pay for it, you can make a feature film without the help of the system. The problem is that once you’ve made it, you have to get someone to watch it. And that becomes the difficulty because there are so many things available, so many channels, so many different pieces of material to look at, that to break out of a pack is very difficult. And that’s what film festivals are for. The film festivals used to be just sort of to appreciate film. But now they actually perform a needed function of spotlighting movies that people wouldn’t ordinarily know exist. That’s exactly the position we’re in. It’s funny you should say — I mean, because we make movies now and we couldn’t do it with film. Yes, no. It’s — so, how much did it cost to make your first movie? Well, the first movie that I made for Roger Corman cost $60,000. And the only reason it got made was because me and a couple of other people who worked there were chafing at the bit to direct a movie. And we weren’t satisfied with just doing the trailers. So, we — on a bet, basically, we said that we would make a picture — we could do it in ten days and we could do it for $60,000 and it would be a releasable movie. The reason was that we were familiar with all the action scenes from previous movies that were made by the company, and we wrote out script around those. And we made it about a movie company making those kind of movies. So, we dressed our actors the way the actors in the clips were dressed. And we cobbled together this comedy together about making movies, which, when you look at it today is actually almost a newsreel of the way pictures were really made — on the low budget level in the ’70s.